Founded in January, 1961. Our chapter members represent twelve school districts and five colleges. We are located in Lawrence and Butler Counties in Western Pennsylvania. Our sisters span many generations chronologically, from women in their twenties through their nineties. We strive to serve our local schools, communities, Alpha Alpha State, and Delta Kappa Gamma Society International programs and projects. Click on the "More" tab and drop down to download newsletters or scholarship applications. Bonnie Barnes was the recipient of the Golden Gift Award. She arrived in Texas for the leadership seminar two weeks before the convention convened. Stef Fulena, Rose Ann Fulena, and Carol Herbert joined her there for the beginning of the convention. Almost 2000 were in attendance. There was a lot of work accomplished as we debated and voted on 122 (!) amendments to our Constitution. It took some extra sessions. 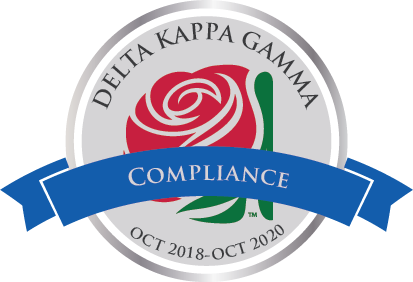 We also attended breakout sessions, banquets, wonderful keynote speakers, tours to DKG Headquarters, fun with our PA sisters, and conversations with sisters from all over the USA and around the world. The next International (2020) will be in PA. Get ready! Ten Alpha Sigma Sisters (Bonnie Barnes, Diana Borowski, Mary K. Davis, Stef Fulena, Rose Ann Fulena, Carol Herbert, Karen Matis, Debbie Mc Millin, Karen Tinstman (Who was coordinator of the entire convention! ), and Octavia Payne attended at the Nittany Lion Inn PSU. Rose Ann, Ursula Payne, and Michelle McCollin were honored as Women of Distinction. Bonnie Barnes, Carol Herbert, and Debbie McMillin attended the Northeast Regional Conference in Canada this July. They returned with great ideas and stories for our chapter. At the conference, Dr. Lyn Schmid, former Alpha Alpha President and former DKG International President became the newest International Achievement Award honoree. Bonnie Barnes, Diana Borowski, Rose Ann Fulena, Stephanie Fulena, Carol Herbert, Karen Matis, Debbie McMillin, Octavia Payne, Ursula Payne, Jean Speight, and Karen Tinstman attended Alpha Alpha State Convention in June 2017. Rose Ann and Ursula were awarded Women of Distinction Honors, presented to them by Alpha Sigma President Karen Matis. Karen Tinstman did an excellent job in her second year of Convention Coordinator, Carol Herbert was in charge of Convention Protocol . Bonnie Barnes serves as The Keystonian editor, Stef Fulena is on the State Comunications Committee. Alpha Sigma received Newsletter and Web Page Awards. All had a wonderful time visiting Alpha Alpha sisters, shed tears remembering sisters who have passed at the Celebration of Life Ceremony, bid farewell to our wonderful outgoing President Tracey Dusch, and welcomed incoming President Barb Gasperini who already has us excited about future endeavors like our new state project with the Girl Scouts. sisters. Several more blankets (final total over 60) were completed and distributed after the event.